Since 2017, individual governments in Southeast Asia have established task forces, convened select committee hearings and have proposed or passed legislation to combat “fake news”. In May 2018 ASEAN ministers responsible for information agreed in a joint statement to collaborate and exchange best practices to combat fake news and mitigate its effects. This development occurred on the back of increased internet penetration across Southeast Asia and the sharing of content over social media through mobile devices. What are the key issues around the emerging legislation in Southeast Asia in relations to fake news. How does the issue of fake news and election intersect? What is the impact of fake news on democracy, rule of law and freedom of expression in the region. Dr. James Gomez is Chair, Board of Directors of Asia Centre a not-for-profit organisation that seeks to create human rights impact in the region. He provides strategic oversight for the development and regionalization of the Centre. Dr. Gomez currently oversees its operations in both Thailand and Malaysia and is leading the partnerships for the Centre’s many activities in other parts of the region. He represents the Centre in media and public speaking engagements and builds relationships with key stakeholders around the world. Dr. Gomez brings to Asia Centre over 25 years of international and regional experience in leadership roles at universities, think-tanks, inter-governmental agencies and non-governmental organisations. 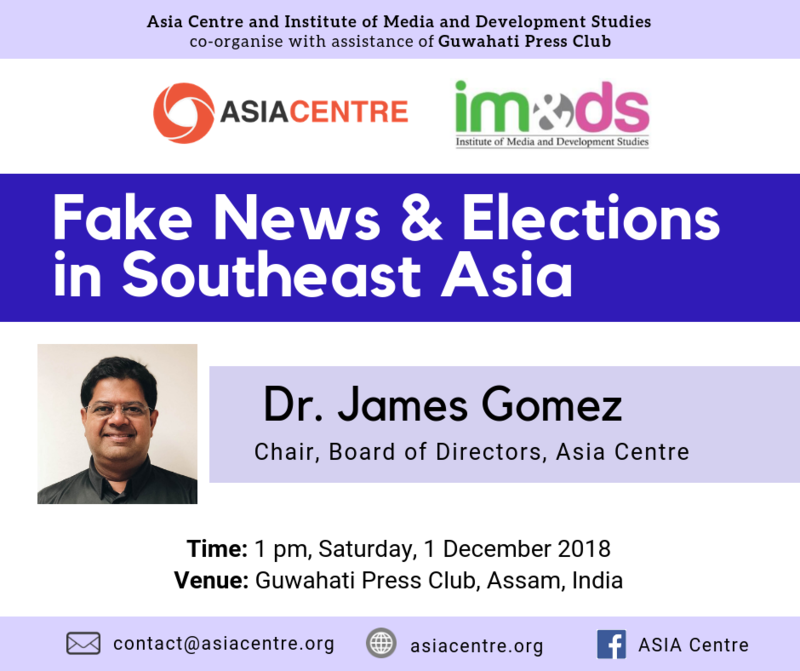 He is the convener of Asia Centre’s upcoming international conference on Fake News and Elections in Asia, 10-12 July, Bangkok, Thailand. For more information about the conference email: contact@asiacentre.org.